This high performance digital 12 bit CCD camera system features state of the art in CCD and electronics technology. The pixelfly qe has an extraordinary quantum efficiency with up to 65%. 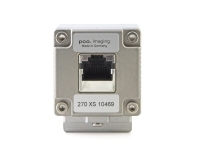 The system consists of an ultra compact camera head, which either connects to a standard PCI or a compact PCI board via a high speed serial data link. The available exposure times range from 5μs to 65s. A digital temperature compensation is integrated instead of a space consuming thermo-electrical cooling unit. All camera functions can be remotely accessed and controlled via digital interface. This compact digital CCD camera system is perfectly suited for many scientific and industrial imaging applications, like microscopy, spectroscopy and quality control.